Ideal for a couple's retreat, the Briland Carriage House is tucked away in the heart of Rosemary Beach and is only 1 house from the sandy white beaches of the Emerald Coast. It is just a short walk from boutique shopping, dining, and just steps to Rosemary walk over B. This elegant property offers plenty of space and is spilt into two levels. On the main level you’ll find an open concept living room, kitchen with full size Wolf gas range, and bar seating for enjoying meals. Just off the living room is a full bath, with walk in shower, and a stackable laundry unit. Escape upstairs where you’ll find a spacious, beautiful bedroom with King bed and another full bathroom with walk-in glass shower. 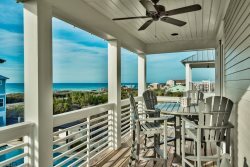 Enjoy views of the gulf just outside your window. Briland Carriage House is the perfect get away for two! Nearby- Inlet, Seacrest, and Alys Beaches offer an array of casual and fine dining, all just a short walk or bike ride away. Book your couple's retreat today! 3) 2 Bikes come with this property. Waiver must be signed to access the bikes.